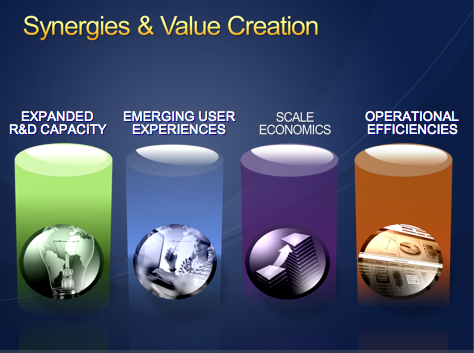 What Would a Combined Microsoft-Yahoo Look Like? Microsoft’s $31 a share offer for Yahoo is made possible by Yahoo’s slumping shares (Yahoo’s stock was trading at about $31 a year ago). While Yahoo has rejected Microsoft’s entreaties in the past, with Terry Semel stepping down as chairman of the board yesterday, things might be different this time. I ran some quick, back-of-the-envelope numbers to see what a combined Microsoft-Yahoo would look like financially, and how it would compare to Google. * Microsoft figures are trailing four quarters and headcount is from June. Search figures from comScore. Those headcount numbers and operating expenses could be cut significantly. Microsoft says it can shave at least $1 billion from operating expenses in a merged company. The real impact to Microsoft, though, is not visible in these numbers because Yahoo represents a new growth opportunity for Microsoft in advertising revenues and online services. During the last four quarters, Microsoft’s revenues for its online services (MSN, Windows Live, aQuantive, etc.) were $2.8 billion and it lost $949 million. So just combining Yahoo with that business, you get revenues of $9.8 billion, but Microsoft would still be showing a net loss for that business of $289 million. But this is an advertising play for Microsoft. It wants to combine the scale of its recently acquired advertising networks with that of Yahoo’s, along with Yahoo’s vast consumer reach (which is appealing to advertisers, who see all those eyeballs as valuable inventory). The Windows user wants to be live. There will be a Windows Live. There will be an Office Live. 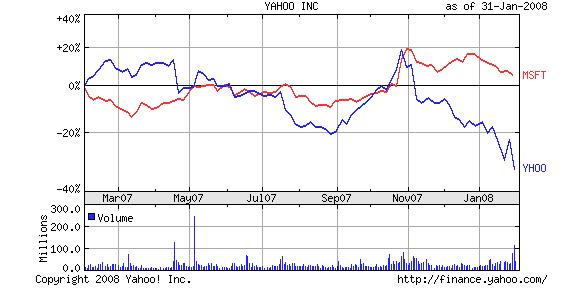 Yahoo clearly has some strengths in this area, with its continued evolution of Yahoo Mail, acquisition of Zimbra, and other initiatives. 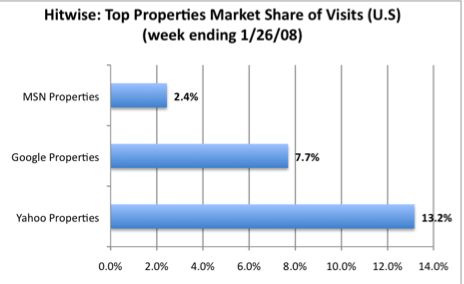 Update: Here are some numbers from Hitwise on the combined traffic reach of Yahoo and MSN properties. Together, they have a 15.6 percent market share of Internet traffic in the U.S. , compared to 7.7 percent for Google properties. But Google still has double teh market share in search of both Yahoo and Microsoft combined.